The result speaks for itself: the longest tragedy (Hamlet) is not the most structurally complex and is less dense than King Lear, Titus Andronicus or Othello. Some plays reveal clearly the groups that shape the drama: Montague and Capulets in Romeo and Juliet, Trojans and Greeks in Troilus and Cressida, the triumvirs parties and Egyptians in Antony and Cleopatra, the Volscians and the Romans in Coriolanus or the conspirators in Julius Caesar. Grandjean’s visualizations show us how varied the density of these plays is. While Macbeth has 46 characters, it only achieves 25% network density. King Lear, with 33 characters, reaches 45%. But does Grandjean’s “result speak for itself,” as he claims? 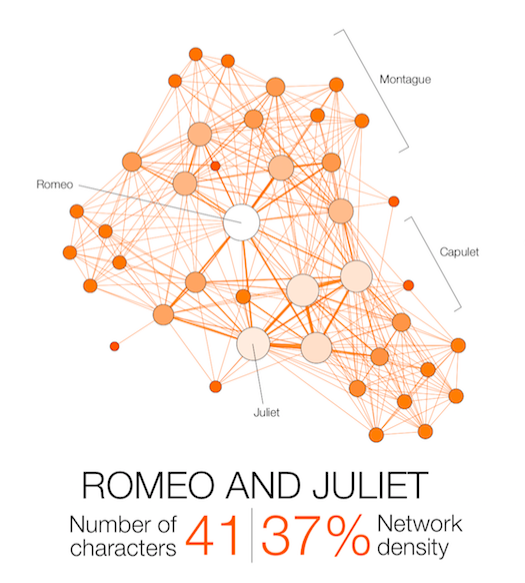 Though he helps us visualize the way characters cluster around each other, most obviously in Romeo and Juliet, above, it’s not clear what a “density” score does for our understanding of the drama’s intent and purposes. With the exception of the most prominent few characters, the graphics only show various plays’ personae as nameless shaded circles, whereas Shakespeare’s skill was to turn most of those characters, even the most minor, into antitypes and anomalies. Perhaps as important as how they are connected is the question of who they are when they connect. You can view and download a complete poster of all 11 of Shakespeare’s tragedies at Grandjean’s website. 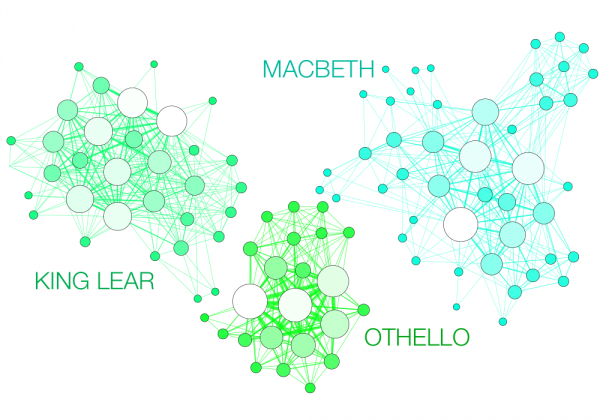 11 Shakespeare Tragedies Mapped Out with Network Visualizations is a post from: Open Culture. Follow us on Facebook, Twitter, and Google Plus, or get our Daily Email. And don’t miss our big collections of Free Online Courses, Free Online Movies, Free eBooks, Free Audio Books, Free Foreign Language Lessons, and MOOCs.